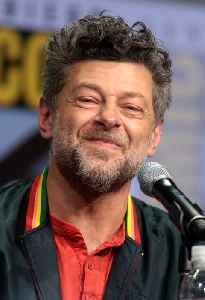 Andrew Clement Serkis is an English actor and film director. He is best known for his performance capture roles comprising motion capture acting, animation and voice work for such computer-generated characters as Gollum in The Lord of the Rings film trilogy (2001–2003) and The Hobbit: An Unexpected Journey (2012), King Kong in the eponymous 2005 film, Caesar in the Planet of the Apes reboot series (2011–17), Captain Haddock / Sir Francis Haddock in Steven Spielberg's The Adventures of Tintin (2011), and Supreme Leader Snoke in the first two Star Wars sequel trilogy films, The Force Awakens (2015) and The Last Jedi (2017). In 2018, he portrayed the character of Baloo in his self-directed film, Mowgli: Legend of the Jungle.